Penn State's loss to Ohio State on Saturday night will not be forgotten anytime soon, as the Nittany Lions found themselves up by 15 in the fourth quarter only to see that lead slip away. And in turn the grading is a bit complicated. On the one hand, Penn State put together the most complete game the Nittany Lions have ever really had in Columbus and one of the most complete games against Ohio State period. But at the same time it's hard to ignore the issues that eventually plagued Penn State in the end. Ultimately, it's the final outcome that matters, and that impacts the grades. Penn State did a lot of things it never does against Ohio State, the Nittany Lions converted 7-of-15 third downs and managed 31 points. Trace McSorley was sharp when he had to be and was deadly on his feet on key downs. Mike Gesicki led the way with six catches for 57 yards and was clutch in his own right. But Saquon Barkley struggled. His kickoff return for a touchdown and his 36-yard touchdown run were the lone high points in a game where the Heisman hopeful managed just eight yards on 20 carries. 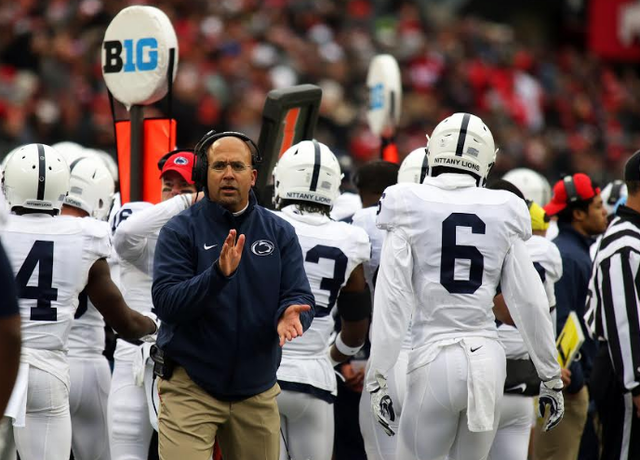 Penn State's offensive front struggled in the trenches like it has all year and Barkley couldn't get anything when the Nittany Lions had to run the ball and kill the clock. So this grade is low, because at the end of the day Penn State played a good game, but the Nittany Lions repeatedly failed to close out a game that they had every opportunity to do so. All told Penn State's defense played a solid game, especially in the first half. 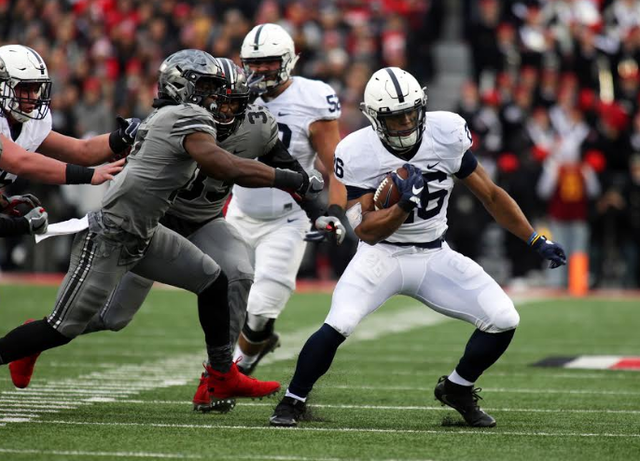 Troy Apke and Koa Farmer both made key plays down the stretch and the Nittany Lions were able to keep Ohio State off the board despite gashing plays by J.K Dobbins and J.T. Barrett. But by the end of the night a few injuries and Penn State's short offensive drives finally did the defense in. Barrett was outstanding in the final quarter and the Nittany Lions couldn't stop Ohio State's attack. Ohio State managed 529 yards of offense, pulled off a comeback and had multiple chunk plays. Some of this is on the shoulders of the defense, a lot of it though is on Penn State's offensive issues as well. This grade would be lower, but for the most part the defense did its part and finally ran out of gas. A blocked punt changed the course of the game, but two long returns, and a key punt late save this grade. Tyler Davis made a field goal that he had to make and Saquon Barkley's return to open the game set an early tone. Of all the reasons Penn State lost on Saturday night the special teams unit certainly had a role in that, but this group probably helped Penn State more than it hurt it. Overall this is the kind of performance Penn State will take every single time against Ohio State. The problem is, this was Penn State's game to win and it didn't. So that has to hurt the grade. Fans will want to forget this one as soon as possible and it's hard to blame them. Next up, a noon kick at Michigan State. As Trace McSorley rolled to his left he heaved a pass skyward hoping that it would find Juwan Johnson. It was a prayer, one of many he had thrown Saturday, and with so many answered it seemed not entirely impossible that Johnson would pull that one down too.